Objectives To assess the safety of intra-articular (IA) autologous tolerogenic dendritic cells (tolDC) in patients with inflammatory arthritis and an inflamed knee; to assess the feasibility and acceptability of the approach and to assess potential effects on local and systemic disease activities. Methods An unblinded, randomised, controlled, dose escalation Phase I trial. TolDC were differentiated from CD14+ monocytes and loaded with autologous synovial fluid as a source of autoantigens. Cohorts of three participants received 1×106, 3×106 or 10×106 tolDC arthroscopically following saline irrigation of an inflamed (target) knee. Control participants received saline irrigation only. Primary outcome was flare of disease in the target knee within 5 days of treatment. Feasibility was assessed by successful tolDC manufacture and acceptability via patient questionnaire. Potential effects on disease activity were assessed by arthroscopic synovitis score, disease activity score (DAS)28 and Health Assessment Questionnaire (HAQ). Immunomodulatory effects were sought in peripheral blood. Results There were no target knee flares within 5 days of treatment. At day 14, arthroscopic synovitis was present in all participants except for one who received 10×106 tolDC; a further participant in this cohort declined day 14 arthroscopy because symptoms had remitted; both remained stable throughout 91 days of observation. There were no trends in DAS28 or HAQ score or consistent immunomodulatory effects in peripheral blood. 9 of 10 manufactured products met quality control release criteria; acceptability of the protocol by participants was high. Conclusion IA tolDC therapy appears safe, feasible and acceptable. Knee symptoms stabilised in two patients who received 10×106 tolDC but no systemic clinical or immunomodulatory effects were detectable. Despite major therapeutic advances, there is no cure for rheumatoid arthritis (RA) and only a small proportion of patients achieve drug-free remission, which is often transient.1 For the remainder, the need for chronic medications with associated side effects, sometimes serious, impacts on overall quality of life. The ideal management of RA is a therapy that returns the immune system to a state of self-tolerance, reversing autoimmunity without requiring long-term treatment. Dendritic cells (DCs) orchestrate immune responses, by ingesting and presenting antigens to T cells.2 ,3 In health they direct immune attacks against pathogens and tumours and, in a distinct state of differentiation, play an important role in maintaining self-tolerance.4 ,5 In contrast, in autoimmunity DCs drive activation and differentiation of autoreactive effector T cells.6 If this inappropriate activation could be reversed and immune regulation restored, self-tolerance should re-emerge. We now report the results of a Phase I trial of autologous tolDC in patients with rheumatoid and inflammatory arthritis. This is only the second reported trial of tolDC in inflammatory arthritis13 and the first to use an intra-articular (IA) route of administration, chosen to optimise the detection and management of potential AEs. We previously reported our method for manufacturing therapeutic grade tolDC investigational medical product (IMP).9 Our full good manufacturing practice (GMP) protocol is provided in the online supplementary methods. TolDC were loaded with autologous synovial fluid (SF) as a source of relevant autoantigens,14–16 enabling the treatment of both patients with seropositive RA and patients with seronegative RA, as well as other arthritides. Prior to administration, tolDC satisfied all quality control (QC) release criteria (table 1). Participants, aged 18 or over, had inflammatory arthritis of at least 6 months' duration, including an inflamed knee joint with an effusion and at least 30 min early morning stiffness. They had failed at least one disease-modifying antirheumatic drug (DMARD), including current therapy. TolDC was added to stable DMARD and anti-inflammatory therapies. Intramuscular glucocorticoids and IA injections of the target knee were not permitted for 6 weeks prior to baseline. Standard exclusion criteria were applied (see online supplementary table S1). This was an unblinded, randomised, controlled, dose escalation Phase I trial of IA tolDC administered into an inflamed knee joint (the target knee). The trial protocol, available at http://clinicaltrials.gov/ct2/show/NCT01352858, was approved by the Medicines and Healthcare Products Regulatory Agency and by the National Research Ethics Service Committee North East (Sunderland) (EudraCT number: 2011-001582-41). The trial was conducted according to the International Council for Harmonisation of Technical Requirements for Pharmaceuticals for Human Use Good Clinical Practice (ICH GCP) and the Declaration of Helsinki. There were three dosing cohorts of 1×106, 3×106 and 10×106 viable tolDC administered via a single arthroscopic injection following saline irrigation. Each cohort comprised four participants, randomly allocated to tolDC (n=3) or control intervention of target knee arthroscopic saline irrigation only (n=1). The decision to dose escalate between cohorts was decided by an independent data-monitoring committee based on safety and tolerability data, recorded 5 days after treatment of the last participant in each cohort. The study design is outlined in figure 1. Following informed consent on day −14, an infectious disease screen was performed and SF aspirated for use during tolDC manufacture. Participants returned on day −7 for leucapheresis. At the baseline visit (day 0), the target joint was arthroscopically irrigated followed by tolDC administration. IA administration was chosen to provide an early and robust signal of disease deterioration and the opportunity for joint irrigation under those circumstances. 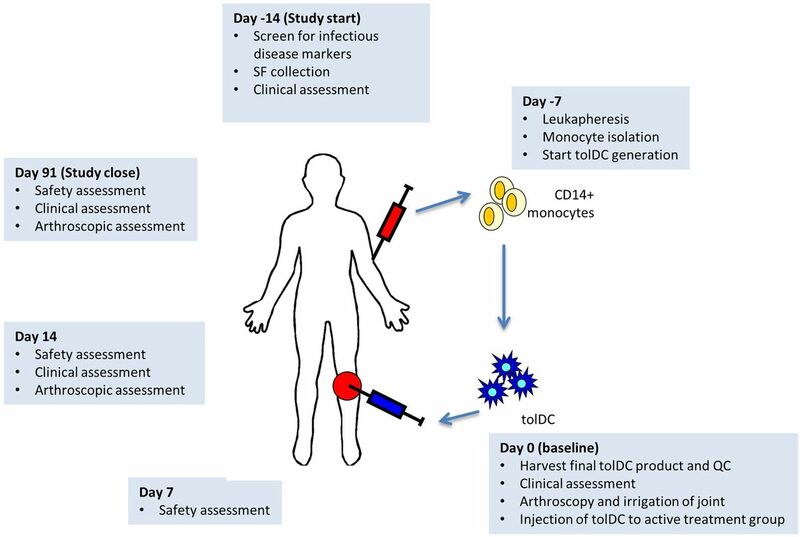 Overview showing tolerogenic dendritic cells (tolDC) treatment protocol. Following informed consent on day −14, an infectious disease screen was performed and synovial fluid (SF) aspirated under ultrasound guidance for use during tolDC manufacture. Participants returned 7 days later (day −7) for leucapheresis, their leucapheresis product being transferred to the good manufacturing practice facility for initiation of tolDC manufacture. After a further 7 days participants returned (day 0, baseline visit) and, following a clinical assessment and ultrasound assessment of the target knee, underwent fibre-optic arthroscopy. The target knee joint was irrigated with 1 L of normal saline, following which tolDC were administered arthroscopically. On days 7 and 14 participants returned for safety assessments. The day 14 visit also entailed an arthroscopic assessment of the target knee. If the participant remained symptomatic and/or the knee remained inflamed an arthroscopic intra-articular glucocorticoid injection was administered. The final study visit on day 91 was identical to the day +14 visit. The primary objective of Autologous Tolerogenic Dendritic Cells for Rheumatoid and Inflammatory Arthritis (AuToDeCRA) was to assess safety of the intervention. Participants were questioned about symptomatic deterioration by telephone on days 1–5, with particular focus on the target knee. If deterioration was reported on two successive days, participants were assessed in person. If deterioration was confirmed, a further arthroscopic examination was performed with irrigation and IA glucocorticoid if indicated. If infection was suspected, this was managed appropriately. Knee assessment tools standardised subjective and objective assessments (see online supplementary figures S1 and S2). Routine safety assessments took place on days 7 and 14. The latter included a further arthroscopic examination and, if synovitis persisted, an arthroscopic IA glucocorticoid injection was administered. The final study visit on day 91 was identical to day 14, except arthroscopy was only indicated if patients had not previously received IA glucocorticoid during the study. The primary outcome was the proportion of participants experiencing a target knee flare within 5 days of tolDC administration and, additionally, the proportion experiencing serious AEs (SAEs) and AEs throughout the trial. Although tolDC were stable in vitro, a significant concern was their potential to become activated in an inflamed environment—our experiments in murine CIA demonstrated worsening of joint inflammation when antigen-loaded mature DCs were administered.11 Knee flares beyond 5 days were deemed more likely to represent inflammation returning post-irrigation, whereas, if tolDC were efficacious, we predicted prolonged symptomatic benefit. Secondary objectives were to assess feasibility and tolerability. Feasibility was defined by the proportion of participants entering the study from whom tolDC could be prepared (the success rate of tolDC manufacture). Tolerability was scored as the proportion of participants who rated the study and its components as partly or completely acceptable, assessed via a questionnaire administered at the final study visit (see online supplementary figure S3). This Phase I trial was not powered for comparative hypothesis testing and basic descriptive statistics are used to summarise outcome data, demographic and operational information. Sixteen participants were screened. SF could not be obtained from three and the cell product did not meet release criteria in participant 8 (see below). Of the remaining 12 participants, 6 had seropositive RA, 1 had seronegative RA, 3 had psoriatic arthritis and 2 had undifferentiated seronegative arthritis (table 2). The 10×106 tolDC cohort contained only one patient with RA, whereas the lower dose cohorts contained three each. Disease duration ranged from 2 to 43 years and DAS28 ranged from 1.4 to 6.0. Background DMARD therapy ranged from nil to biological therapy. Table 1 provides the QC release criteria for tolDC, encompassing viability, sterility, phenotype and function. The IMP generated from cells of participant 8 had higher cell surface CD86 expression than specified in our release criteria and therefore could not be released as part of the clinical trial. All other release criteria were met and, following informed discussion, the participant elected to receive the product but their data are reported separately. Toll-like receptor 2 is upregulated during tolDC differentiation and, while recorded in table 1, did not constitute a release criterion. Online supplementary figure S4 exemplifies flow cytometry QC data. No participants developed worsening symptoms in the target knee during days 1–5. There were two SAEs, both in participant 3 with highly active, refractory RA (table 3). A generalised RA flare occurred on day 70, requiring hospitalisation. Adalimumab was switched to tocilizumab but the participant was re-admitted 15 days later with pneumonia requiring IV antibiotics. Both events were felt unlikely to be related to tolDC. 37 AEs were recorded (table 3). 15 were felt possibly related to therapy, largely because of their timing. Despite the lack of protocol-defined target knee flares, there were three episodes of target knee synovitis requiring treatment, noted on days 7 (participant 9) and 10 (participants 1 and 5). Participant 9 also had contralateral knee synovitis, present since baseline. In addition participant 3, who was hospitalised with an RA flare on day 70, also suffered a flare on day 9. Two of these AEs occurred in the 1×106 tolDC and two in the 3×106 tolDC cohort. Participant 7 reported increased target knee stiffness on day 9 and participant 13 reported generalised stiffness and discomfort on day 23 but, clinically, these were not disease flares. Participant 13 subsequently developed non-target knee synovitis on day 84. Two episodes of rhinorrhoea (3×106 tolDC and control), two episodes of upper respiratory tract infection (10×106 tolDC and control) and folliculitis (10×106 tolDC) were the only infectious AEs, excluding wound infections (see below). Two participants with psoriatic arthritis reported minor worsening of psoriasis on days 6 and 62. There were two reports of self-resolving knee pain, one provoked by exercise. Twelve AEs were possibly, probably or definitely attributable to procedures, including two wound infections (one in participant 8 whose product failed QC) and a fluid leak, an episode of citrate toxicity related to leucapheresis and a vasovagal episode related to arthroscopy. Self-resolving AEs occurring within 24 h of tolDC administration, such as fatigue or target knee pain or stiffness, were attributed to the procedure rather than to tolDC. All AEs were assessed as mild or moderate with no evidence of a dose–response relationship. In particular knee, or systemic disease, flares only occurred in lower dose cohorts, apart from a late (day 84) non-target knee flare in participant 13. TolDC that met release criteria were manufactured from 9 of 10 production runs (see above). Participant acceptability was high (table 4). About 91% of participants rated the study overall as acceptable. Equivalent percentages were 88%, 75%, 91% and 64% for leucapheresis, knee aspiration, ultrasound and arthroscopy. About 91% found participation convenient and 90% would participate again. Figure 2 illustrates the exploratory outcome of arthroscopic assessment of target knee synovitis on day 0 and day 14. A 0–4 scale was used to estimate synovial hypertrophy, vascularity and synovitis. One participant in the 10×106 tolDC cohort declined day 14 arthroscopy. There was no evidence for change in synovial hypertrophy with tolDC, improvement being noted in only one control participant. Two of three participants receiving 3×106 tolDC and one of two assessable participants receiving 10×106 tolDC demonstrated improvement in vascularity on day 14, whereas no improvement was seen in six participants receiving 1×106 tolDC or control intervention. Synovitis improved in one of three participants in each of the 1×106 and 3×106 tolDC cohorts and in both assessable patients in the 10×106 tolDC cohorts, but zero of three controls. Notably there was no worsening of any arthroscopic parameter at day 14 in the 10×106 tolDC cohort. Furthermore, although most patients did not report target knee flares, 10 participants received IA glucocorticoid at day 14 for arthroscopically evident synovitis. The exceptions were two participants in the 10×106 tolDC cohort, one of whom declined day 14 arthroscopy due to symptom resolution (participant 10) and the other, participant 12, had near complete resolution of synovitis at arthroscopy. Both remained asymptomatic and declined day 91 arthroscopies. Interestingly, participant 8, whose cells failed release criteria, also did not require IA glucocorticoid on day 14; day 91 arthroscopy revealed stable hypertrophy and vascularity but mild worsening of synovitis. There was no consistent trend in DAS28 or HAQ scores across the dosing cohorts (data not shown), nor in peripheral blood T-cell phenotype or serum cytokine levels (see online supplementary figures S5 and S6). Arthroscopic synovitis scores are presented. Hypertrophy, vascularity and synovitis were scored on a 0–4 scale (17). (A) Individual patient data are illustrated for days 0 and 14 (one patient in the 10×106 tolerogenic dendritic cells (tolDC) cohort declined day 14 arthroscopy). (B) Fold change is shown in hypertrophy, vascularity and synovitis scores compared with day 0. Data are plotted as the mean value for each cohort. The primary purpose of this unblinded Phase I trial was to assess the safety of autologous tolDC therapy. We consequently designed our trial to provide a robust signal of worsening synovitis and a means to address this if it occurred. IA administration served both purposes: a tolDC-induced flare should have caused a rapid and significant increase in target knee synovitis, in which case the joint could be irrigated and treated with local glucocorticoid. We estimated 5 days as a likely time course, because pathogenic T cells are enriched in an inflamed joint18–20 and could potentially be activated if tolDC were unstable. No flare occurred within this timeframe although four episodes of target knee or systemic synovitis were recorded between days 7 and 10, in participants receiving 1×106 or 3×106 tolDC. Furthermore, at day 14, local glucocorticoid was administered for arthroscopic synovitis in all patients in the 1×106 and 3×106 tolDC cohorts as well as all three controls. In contrast, two of three participants who received 10×106 tolDC did not require local glucocorticoid throughout the study. Therefore, we cannot state unequivocally that tolDC therapy is safe but it is possible that most participants in this small trial received a subtherapeutic dose of tolDC, the ‘flares’ and arthroscopic synovitis on day 14 reflecting the natural history of synovitis following joint irrigation. Participant 3, with refractory RA, suffered two SAEs. The first was a disease flare 10 weeks after tolDC treatment. Adalimumab was switched to tocilizumab but pneumonia developed 14 days later. Neither SAE was felt related to tolDC therapy. This participant also suffered a generalised RA flare on day +9, suggesting they had unstable disease. Skin psoriasis was reported as stable at baseline in patients 4 and 10 and, therefore, minor worsening on days 6 and 62 was deemed potentially attributable to tolDC. The only infections recorded were two wound infections related to arthroscopy ports, two upper respiratory tract infections, two episodes of rhinorrhoea and one of folliculitis. All AEs were categorised as mild or moderate, with no dose–response. Each tolDC product was subject to QC assessment. Purity, surface phenotype and cytokine production were based on characteristics which we have consistently observed to distinguish tolDC from mature DCs. Because of a necessarily narrow time window following completion of manufacture (approximately 3 h), some data were unavailable at the time of administration. Sterility of the administered product, and cytokine production, only became available later (secondary release criteria). Only one product failed to meet primary release criteria, with CD86 expression modestly above the specified limit. Despite the intensive nature of the protocol, 91% of participants rated their experience as acceptable. Arthroscopy itself was rated least favourably, but most participants totally (4/11) or partially (3/11) rated it as acceptable. About 90% would participate again in a similar study. On the basis of this small, unblinded, Phase I trial we believe that tolDC therapy is safe and worthy of further investigation. This conclusion is based on the absence of protocol-defined target knee flares and on anecdotal evidence of improvement in participants in the highest dose cohort. There were three knee flares recorded 7–10 days post-tolDC administration but these occurred in the lower dose cohorts and are therefore more likely to reflect the natural history of knee synovitis following joint irrigation. Because there were no prior reports of tolDC administration in participants with inflammatory arthritis, our dosing regimen was based on cancer strategies. In those scenarios, however, mature DCs boost an anti-tumour immune response and extrapolation to tolerance induction is not necessarily appropriate. Indeed, extrapolation from our prior work in CIA would have predicted a higher therapeutic dose. 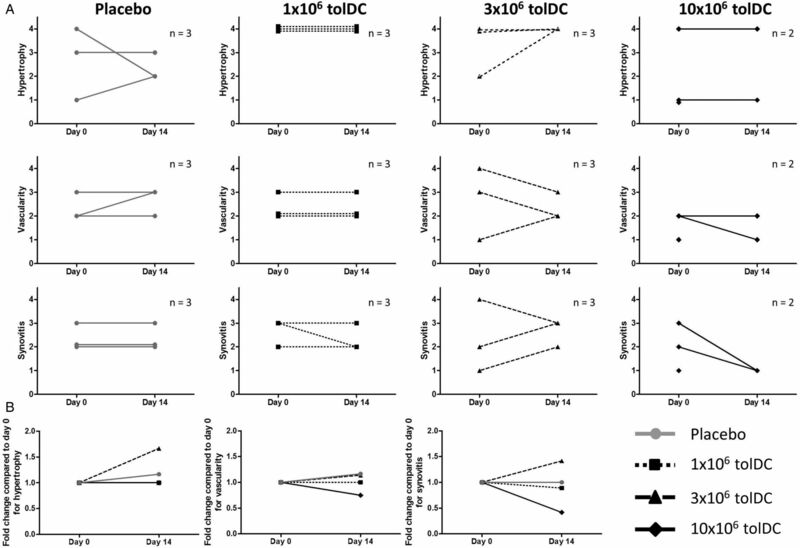 In contrast, in a recently published study in RA, 1×106 and 5×106 autologous modified DCs loaded with citrullinated peptide antigens demonstrated possible clinical benefit and biological activity.13 However, those cells were manufactured by exposure to a nuclear factor kappa-light-chain-enhancer of activated B cells (NF-κB) inhibitor and were administered intradermally. The IA route, while providing a robust safety read-out, may provide a more challenging environment for tolDC to demonstrate efficacy. An important additional question is whether the IA route could provide a systemic effect. No such effect was evident in our study, either clinically or in terms of T-cell modulation. We are currently planning an extension to AuToDeCRA in which 10×106 tolDC will be radiolabelled before IA administration. This will address whether IA tolDC migrate to local lymph nodes, where they could modulate the systemic immune response. While ideal for assessing safety, and well-tolerated by participants, IA tolDC administration is an invasive intervention. TolDC have also been administered intradermally in juvenile type 1 diabetes22 and intraperitoneally in Crohn's disease.23 Intradermal administration provides a more convenient route of administration particularly if, as in our preclinical studies, multiple tolDC administrations are ultimately required for robust efficacy.11 Similarly, loading tolDC with autologous SF broadens the target population and obviates the need for tissue-typing, which is generally necessary when loading tolDC with autoantigenic peptides. Nonetheless, joint aspiration is a further invasive procedure and three participants were excluded because SF could not be obtained. Thus, there are advantages and disadvantages to our current protocol. Nonetheless, we believe that AuToDeCRA has defined a safe, and potentially active, dose of tolDC on which to base future work. The authors would like to thank the Flow Cytometry Core Facility at Newcastle University Faculty of Medical Sciences for assistance with flow cytometry; and the staff of the NIHR Clinical Research Facility at the Royal Victoria Infirmary, Newcastle upon Tyne. GMB and AEA are joint first authors. Contributors GMB, AEA, JD, RR, OE, RAH and JD carried out the study; JDI and CMUH conceived and designed the study; TF and TC performed statistical analysis; CMD and MEMC oversaw the clinical trial; AMD supervised the good manufacturing practice production process; JDI supervised the study and drafted the manuscript; GMB, AEA, JD, OE, RAH and CMUH contributed to drafting the manuscript; all authors provided feedback on the manuscript. Funding This work was funded by Arthritis Research UK grant 18155. Research within the Musculoskeletal Research Group is supported by the National Institute for Health Research (NIHR) Newcastle Biomedical Research Centre based at Newcastle Hospitals NHS Foundation Trust and Newcastle University. The views expressed are those of the author(s) and not necessarily those of the NHS, the NIHR or the Department of Health. CMUH and JDI have received support from the European Cooperation for Science and Technology Action to Focus and Accelerate Cellular Tolerance-inducing Therapies (A FACTT; BM1305; http://www.afactt.eu). Ethics approval National Research Ethics Service Committee North East (Sunderland).